Home » Articles » Business Growth » The Number One Least Asked Question in Social Media…Why? Asking “why” in all aspects of business and life in general is unexploited. Day in and day out I help businesses understand the opportunity that lies within new media, not because of Twitter or Facebook. I do so because opportunity is pervasive in the hearts and minds of consumers everywhere. We just have yet to really understand for what reason. Report after report, post after post, conference after conference, I am inundated with examples of social media success. Except success is difficult to assess, unless we look at the numbers, sentiment, clickthroughs, and outcomes. Rarely do I see studies, although they are out there, that ask the social customer what they value and why. In 1964 Marshall McLuhan proposed in his book, Understanding Media: The Extensions of Man, that the “medium is the message.” His observation was that the medium, not the content it disseminates, requires attention and study. He believed that the medium shapes society based on the characteristics of the medium itself. As Twitter, Facebook, et al. cultivate a dedicated egosystem and supporting culture, McLuhan’s theory is still valid. In an era where information is democratized and influence is equalized, the message is now also the medium. There are prevailing cultures unique to each social network. What you create for Twitter is different than what you might say in Facebook and certainly not at all how you would say it in Google+. That’s the point. What you say defines not only who you are and what you represent in each network or medium, but it also influences the society at large. What does your profile or presence say about you? What does it say about who you are in each network? How does it signify the value you introduce into your networks? I’m often asked to research systems and processes to make social media participation cost efficient and scalable. When I ask why, the response is not necessarily a surprise nor is it a real answer, “we need to operationalize social media. we need cost efficiencies.” In reality, many businesses syndicate rather than engage. A Tweet could find a new home on the Facebook Brand Page, which is then linked to Tumblr, and, well you get the idea. There are management systems that facilitate one-to-many publishing and that’s not necessarily a bad thing. One update to rule them all right? Only when the update is deemed valuable by the community at large. Social channels do not represent syndication opportunities as much as they offer unique touchpoints to engage with different groups of stakeholders. They’ll tell you what they want, in fact many already have. But, are we listening? Are we asking the right questions? Are we introducing what we learn into our strategies moving forward? I want to come back for a moment to the question of why. Why are businesses engaging in social media? Let me ask this question again because it’s important. Why are businesses trying to be social when to date, most have made a business out of being anti-social? The voice of the consumer is in risk of falling upon deaf ears as businesses explore operational efficiencies before they can get the answer to why customers want to engage with them in social networks. First and foremost, it’s not “to get information” nor is it to build “a community with the brand.” Customers are far too practical and distracted to invest their time in the long-term for such reasons. It starts with asking customers what they want now and over time so that we can answer why we’re investing precious time, resources, and passion into social media. It comes down to value. It comes down to experiences. People appreciate when they’re heard and in turn, when businesses intend to deliver exceptional experiences. Why do you think it is that people line up for Apple products when they’re released? Let’s take the iPad for example. What is it about that iPad that people must have over all of the other tablet alternatives available? Why is it that people pay 2-3x more for an Apple Macbook than those running Windows or Chrome? Why do customers buy from Zappos instead of Amazon.com? Or, why do people love or go out of their way for Starbucks or Dunkin Donuts over every other brand? Each question has a unique answer, but many share a common theme, each company delivers an experience that’s worth having, investing in, and sharing over and over again. It comes down to people, the 5th P of Marketing. Knowing who they are and what they want is enlightening as it affects not just the other 4P’s of product, place, price, and promotion, but also defines the user experience. It brings the “why” to life. Truth be told, we can’t have meaningful discussions about becoming a social business if we don’t know why doing so is advantageous to customers and ultimately to the business itself. So, let’s start with a simple exercise to get us on the right path. Try taking the place of your customer for a moment. Take some time to think about and answer the following questions, then revisit your social strategy for the year and see what it is that you would change and why. At the very least, you’ll have the reasons to justify a new pilot, direction, or plan. 1. Why should I like you on Facebook? 3. Why would I value the experience? What would I take away? 4. Why would I want to stay connected over time? 5. Why would I choose to engage your updates in my social stream over those of my real friends? 6. Why would I tell everyone I know to follow you? 7. Why would I share your content with my audience of peers? 8. Why would I decide to invest my time and express loyalty in your network and not mine? 9. Why should I care if you don’t care about my needs, experiences, or questions? 10. Why should I come back? Answering these questions will also help you answer an important question to move forward in any meaningful, long-term direction. This exercise unlocks an important ingredient in any customer-facing business strategy…empathy. Once we truly hear our customers we are inspired by the empathy that develops simply by being human. Why are you investing in a social presence? Why are you trying to become a social business? Why will you succeed where others can’t? Certainly brand affinity plays a significant factor in all of this. But, what if brand affinity was an hour glass. Taking it for granted suggests that time could run out. Continually monitoring and turning it when needed ensures longevity. And that’s what this is all about. Social is not a means, nor a means to an end. It is an enabler to do something purposeful, meaningful, and valuable. Your customers will tell you. The reality is that attention is what it is. And as a result, brands must earn relevance today and every day. And it starts with answering a simple question…why? Bravo. That’s what I like to hear! The 10 questions about what your customers want from you are great reminders for companies. They should continually be revisited as we attempt to engage with our audiences. I also agree that social media platforms have different audiences with different interests. It’s important to recognize these preferences and how to tailor your goals for each medium. Why is the beginning, is the question to ask to understand the other person’s reasons. I always ask my clients why they want to do a website, a design, logo or branding. Asking why leads to lots of more questions, and interesting answers. Refreshing post, Brian! I especially liked #6 above as it forces me to evaluate my social inventory and identify which areas are most valuable to my potential followers. Thanks & cheers! I’m currently revamping my professional service’s online presence. Thank you for reminding me to consider why I’m investing in social media in the first place, and to consider the questions my future clients are asking me. Because my services help nonprofits achieve sustainability through telling engaging stories, I quite naturally see storytelling at the core of “The 5 P’s.” The stories I tell to the “People” will authentically answer every “Why” question they may have. I expect the result to be genuine long-term engagement, and steady growth in new clients. The gem for me? “Try taking the place of your customer for a moment … then revisit your social strategy for the year and see what it is that you would change and why.” Spot on! Hi Mark, glad to see that some «old old old strategy» has survived the times. Yep, best way to know if what you do is right is to live it as a customer. Note a word of wisdom: only take the place of your customer if you can behave live and feel like him. I’ve heard and seen people say: I’d never do that, it won’t work. They were «zillionaire» selling to the «average Joe». Only if you can get out of your own «you» and be the customer do it , otherwise you’d be worse off. So true. There’s so much to be discovered when you ask Why. You begin to question and drill down into the reasons Why for most everything. And with those answers, you can then begin to find your true purpose. Thanks! So many great points! I especially enjoyed the 5 P’s, a refreshing and brilliant change from what was drilled into me in college. Renee, can you believe it’s been 40 or so years? Brian, this is perfect. When I see people syndicating their stuff across so many channels, I just get burned out. I *love* hanging out on line. In fact, I can easily be found on Skype of all places. Pure signal, no noise, and the chat histories are awesome. Love the idea of egosystem. I went back & read your Sept. 10 article on this. The 1st generation of social tools and social actions (likes, check-ins, etc.) are incredibly tied to ego. I’m hoping this will evolve over time…I also love the idea of putting people in the center of everything we do in marketing. This is really empowering. The future Ryan is up to you! I love your work Brian, but notice your own Twitter feed doesn’t show great evidence of engagement with your network. It’s largely one-way messages. Few replies, RTs, conversations. Quite a contrast, for example, with other social media thought-leaders like Gary Vaynerchuk or Chris Brogan or Liz Strauss who seem in perpetual conversation. I have no doubt that your audience values your output highly, but I wonder if they feel engaged? Or perhaps you don’t care? I’m not sure I can keep replying to this question. I might have to do what Chris Brogan did and write a post to link to in the future. It’s true, I’m not in perpetual conversation. I run 2 companies and am in the middle of finalizing my next book, plus travel quite a bit for work and speaking. I do Engage however on Twitter through my @mrsolis account and attempt to answer every question or comment. I’ve been running a test on @briansolis for the last year + where I limit engagement, hence the other account, to see how conversation levels affect resonance and “influence” scores. I’ve some very interesting findings by the way, which I’ll publish as soon as it comes out of editing. Additionally, I engage as actively as I can here, as well as Google +, Facebook, and on outside blogs that are looking for responses. Hope that clears things up. I didn’t realise about @mrsolis or the experiment. Thanks for engaging with me! Arggghhh why can’t I +1 this! You have captured something that many brands fail to understand. I’m a brand ambassador and I’m thankful that the marketing team believes in the power of social media and that people who use their products ate the most effective people to share their experiences. And I believe you in the hour glass concept. Nobody should rest on laurels. That’s why they invented the phrase — 15 minutes of fame. Or is it 15 seconds? Brilliant Brian. I love this article. There is a big difference between doing social and being a social business. I don’t think we can truly “be social” without asking WHY. We work with many clients who at first *think* they want to *be social*. Yet when you get down to brass tacks they don’t know who their customers or even partners are. Since they don’t know them they have a difficult time having a relevant conversation with them. Traditional marketing and advertising has brainwashed them into the one way dialog for so many years I think many biz leaders are having a difficult time accepting the fact that it simply won’t work that way anymore. They get ahead of themselves and think time to market of each random act of social media is more important than an integrated approach that supports a relevant conversation and value at every touch point. The importance of asking “why” was drilled into me in a storytelling workshop, and I’ve seen its influence everywhere since. In creating a story, it’s important to communicate motive and intent behind every action a character does. Equally for social media, it’s important to know the motive and intent behind everything we ourselves do. Asking “why” allows us to find these answers. We are the characters of our own story, and thus it’s important to know why we do what we do. “Why” is such a powerful word, so bravo in calling attention to it! Hi Brian! I enjoyed reading this post! Its’ a bit weird to say that I really wish professors would teach these things. 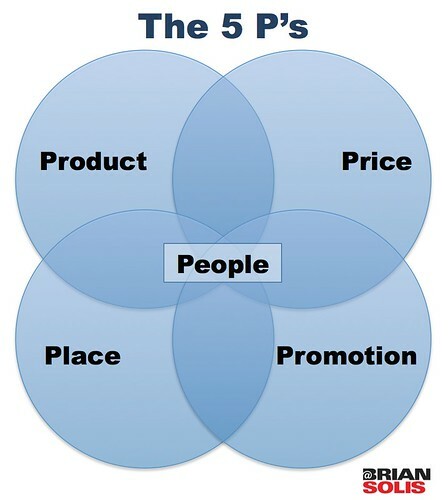 We got taught as a marketing major the “4P’s” but you are definetely missing the “PEOPLE” component. Thanks for being an inspiration to marketing students all around the world! Excellent ONE MILLION DOLLAR question!!! Nice post. I like your 5 p’s. But in this day and time people still make the world go around.